Ronald Reagan swept into office in 1980, capturing nearly 10 times as many electoral votes as his incumbent opponent Jimmy Carter. The Republican Party was also able to ride Reagan's coattails to capture their first majority in the Senate since 1954. The long national nightmare was over. The United States was filled with hard-working, God-fearing citizens who cared about their fellow Americans. Inflation and unemployment were problems of government, not the national character. Vietnam was over; America was the most powerful nation in the world. The Soviet Union was an evil empire. Old-fashioned initiative and ingenuity would maintain America's competitive edge in commerce. These themes soothed a nation sick with the malaise of the 1970s. When all had seemed lost, a grandfatherly figure stepped forth and optimistically reassured Americans that the age-old beliefs they held about the grandeur of the United States were not myths. This man, Ronald Wilson Reagan, understood the sprit of the times, and his message, personality, and politics dominated the 1980s. Traditionally, working-class Americans, Southerners, Catholics, and urban dwellers had strong ties to the Democratic Party. The Republicans relied heavily on support from the rural Midwest, Protestant leaders, and wealthier voters. Ronald Reagan built a new coalition for the Republican Party in his quest for the Presidency in 1980. 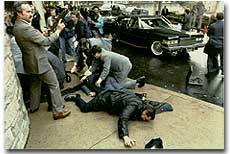 Chaos ensues following an assassination attempt on Ronald Reagan in March 1981. Reagan was hit in the chest but managed a quick recovery, returning to the White House less than two weeks later. Working Americans were shocked to see unemployment rates nearing double digits. Inflation was pushing the middle class into tax brackets previously reserved for the affluent classes. Reagan promised to reduce their level of misery with sound fiscal policy. Southerners disgruntled by affirmative action and busing found friendly ears in the Reagan campaign. The endorsement of Reagan by the Protestant establishment did not deter devout Catholics from voting Republican, since Reagan promised to oppose abortion rights and promote family values. Crime-plagued city denizens looked to Reagan for comfort as he portrayed himself as the law and order candidate. Americans across demographic lines were warmed by his promises for a stronger America domestically and overseas. Very quickly, these "Reagan Democrats" crumbled the old alignment. Jimmy Carter, his opponent in the 1980 election, never stood a chance. Reagan's victory over the incumbent Carter was an electoral vote landslide. He tallied 489 votes to Carter's 49. The Republicans also captured a majority of the Senate for the first time since 1954. Analysts point out that this perceived mandate might have been overstated. Voter turnout was the lowest in the history of Presidential elections. Liberals argued that people were not voting for Reagan's conservative agenda as much as they were voting against Jimmy Carter. During his re-election campaign, Carter endured an approval rating of 23 percent — lower than Richard Nixon's in the darkest days of Watergate! The new President seemed to be in the right place at the right time. Within hours of his inauguration, Iran released the American hostages that had been held for 444 days. Dubbed "The Great Communicator," Reagan had a smile and a confidence that comforted many. At the age of 69, he was the oldest President ever to take office, but he exuded a youthful vitality that obscured his years. The "Reagan Revolution" continued in 1984 as Reagan defeated former Vice President Walter Mondale in a landslide victory. Mondale and his running mate Geraldine Ferraro managed only 13 electoral votes to Reagan's 525. Even an assassination attempt worked in his favor. When John Hinckley put a .22 caliber bullet in Reagan's chest within two months of his inauguration, he took it all in stride. "I hope you're all Republicans," he quipped to the physicians that greeted him at the hospital. His popularity soared. Charges that he had little control over his staff and a less than functional understanding of many matters of policy fell mostly on deaf ears. He earned a reputation as the "Teflon President" — no scandal could stick to him. 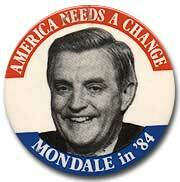 In 1984, Reagan won a smashing re-election campaign over Walter Mondale. Democrat Mondale, running with the first woman nominee for Vice-President, Geraldine Ferraro, won only his home state of Minnesota and the District of Columbia. 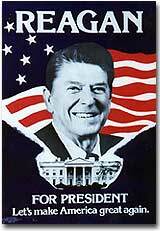 A 1984 Reagan campaign as declared proudly, "It's morning in America." Whether the claim was fact or fiction, American voters accepted Reagan's assurances and enthusiastically cried for a second term. This timeline offers a quick look at the life of Ronald Reagan, from PBS's American Experience. Ronald Reagan defeated Jimmy Carter by over 400 electoral votes in 1980, and Walter Mondale by over 500 electoral votes in 1984. Ronald Reagan left office in 1988, but the U.S. may still be feeling the benefits of "Reaganomics." Leading up to the election of 1980, Republicans coined the term "misery index" to refer to the combination of inflation and unemployment that was plaguing America during the Jimmy Carter years.